I was fortunate that the timing of cpd23 coincided neatly with preparing my CILIP Chartership portfolio. As well as my blog posts, my portfolio was the major outcome of my reflective practice this summer/winter (depending on your hemisphere). It was loooooooong. Not just completing each Thing, but just reading the instructions each week came to be a bit of a task in itself. If you’re planning a 23 Things programme of any sort, I advise keeping the posts for each Thing short and sweet, and give clear actions at the end of each one. Focus on reflection. I found this difficult, but I know/hope it’s good for me. If you haven’t yet done a personal SWOT analysis, try this guide from Mindtools to help you get started. 20 Library careers: routes in and what does this type of work actually involve? Thing 21 is all about promoting yourself in job applications and at interview. Although I have quite a lot of experience of these processes, I found that I wasn’t comfortable with the idea of publishing these details on the web (as laid out in the Thing 21 instructions). Recently, I had a similar experience with my Chartership portfolio. When you submit your portfolio for assessement, you are asked if you are willing to make your document available for others to see. I opted out of that because I felt that some parts of my portfolio, especially my personal SWOT analysis, were things I wanted to keep private (or at least limit the audience to just my assessors!). However, I promise that I am doing things like constantly revising my CV and I hope this will satisfy the requirements for this Thing! Thing 22 encourages us to consider the value of volunteering to get experience. At this stage of my career, I think this has evolved from volunteering to do library work without pay to offering to take on further professional duties such as serving on committees and working groups. I am currently involved in committees such as the Oxford Libraries’ Web 2.0 Working Party, an Aleph working party which is involved in fine-tuning some circulation settings on our new ILS following its launch in July, the Committee of College Librarians and the University of Oxford LGBT Steering Group. I like being involved in groups and activities that broaden my professional awareness beyond the horizons of my own workplace. I think this is especially important in a federal organisation such as the University of Oxford. Library careers: routes in and what does this type of work actually involve? I have taken part in the Library “Day in the Life” project twice. Many people blog, tweet or otherwise record their day in terms of how long they spent answering emails etc, but I wanted to take a difference approach in which I blogged about a specific aspect of my job each day. I don’t think my path into librarianship was unusual: there is quite a lot of cross-pollination between careers in libraries and education – but I find that I am unusual in having a background in science. If you’re considering a career in libraries, try to offer as wide a range of skills as you can. Customer service is important, as are numeracy and skills in strategy, analysis and planning. Being a manager of other people is a part of most jobs above a certain grade level, and it’s a great opportunity for your own development too. I would like to see more people coming into the profession with a positive attitude to one day being a manager. I began this task with some degree of trepidation, having explored Prezi in the past but failed to make it do what I wanted it to do. I know I’m still a long way off being a ninja Prezi user, but it has restored my hope that I can learn how to use this, and will definitely have another go with it the next time I’m presenting. I use Slideshare for stashing presentations I’ve made so that other people can access them (sadly only one on there at the moment). Twitter – great for making new library contacts, a bit of banter and also for benchmarking with professionals outside of my usual sphere. I have often wished that instead of compiling a Chatership portfolio, I could just ask Michael Martin at CILIP to read my blog and tick ‘chartered’ on my membership record, but sadly it ain’t so simple. He has read my blog though – thanks, Michael! RSS (via Google Reader) – essential for keeping up-to-date with new developments in the worlds of libraries, technology and Cute Overload. LinkedIn – Many people I’m connected with on LinkedIn are also people I follow on Twitter, and it’s on Twitter that we interact most, so at the moment I currently use my LinkedIn more like a Panini* collection of people I know rather than for active networking. *When I was at school in Belgium, Panini stickers were highly sought after. 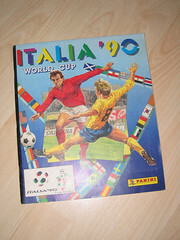 I am delighted that someone somewhere has scanned in their complete Italia World Cup 1990 collection. Well done for finishing that – I could never find the German goalkeeper. As mentioned in the instructions for Thing 18, these take a lot of work. The value of these tutorials is in providing a basic introduction for students at any time and in any place with internet connection. You might like to conclude your tutorials with an invitation to library users to come to the library for 1:1 support on more complicated enquiries. In my sector (academic libraries), I think the most important kind of advocacy work involves demonstrating value for money and outreach. Although the squeeze on library budgets is an issue (and probably one that will never go away), I think a more urgent problem is that many library users do not understand the connection between access to electronic resources and the fact that these are (1) subscription resources and (2) they are paid for by the library. What many library users see is a reduction in print periodicals (and maybe books too) and conclude that libraries must not need as much money if they are buying fewer periodical titles. Improvements in access (e.g. IP authentication, sign sign-on login) mean that many users don’t realise that when they go to a platform such as ScienceDirect on a campus PC, they have just passed through a paywall to a resource they only have access to because the library has paid for it. And library staff do a lot of work behind the scenes to keep this access live and help people learn how to use these resources. So although the role of libraries in academia is not under threat in my institution, the roles they play and how their money is spent is changing from things you can see and count easily to more invisible things like electronic access and teaching information skills. Advocacy has a key role to play in educating people about how academic libraries are changing and demonstrating the value of their more intangible, invisible products.